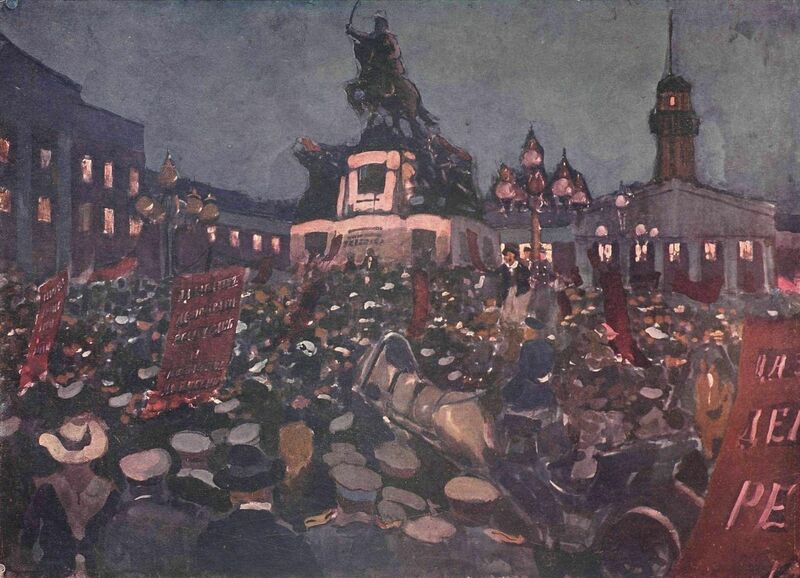 Skobelev Square during the February Revolution, by A.M. Gerasimov. Open Source. The tsarina, who had always taught the tsar not to yield, here too tried to remain firm. On the 26th, with an obvious desire to hold up the shaky courage of Nicholas, she telegraphs him: “It is calm in the city.” But in her evening telegram she has to confess: “Things are not going at all well in the city.” In a letter she says: “You must say to the workers that they must not declare strikes, if they do, they will be sent to the front as a punishment. There is no need at all of shooting. Only order is needed, and not to let them cross the bridges.” Yes, only a little thing is needed, only order! But the chief thing is not to admit the workers into the city— let them choke in the raging impotence of their suburbs. On the morning of the 27th, General Ivanov moves from the front with the Battalion of St. George, entrusted with dictatorial powers—which he is to make public, however, only upon occupying Tsarskoe Selo [a former imperial residence, 24km outside of St. Petersburg] . “It would be hard to imagine a more unsuitable person,” General Denikin will recall later, himself having taken a turn at military dictatorship, “a flabby old man, meagerly grasping the political situation, possessing neither strength, nor energy, nor will, nor austerity.” The choice fell upon Ivanov through memories of the first revolution. Eleven years before that he had subdued Kronstadt. But those years had left their traces; the subduers had grown flabby, the subdued, strong. The northern and western fronts were ordered to get ready troops for the march on Petrograd; evidently everybody thought there was plenty of time ahead. Ivanov himself assumed that the affair would be ended soon and successfully; he even remembered to send out an adjutant to buy provisions in Moghilev for his friends in Petrograd. On the morning of February 27, Rodzianko [Chairman of the Duma and, for a few days, Prime Minister following the February Revolution] sent the tsar a new telegram, which ended with the words: “The last hour has come when the fate of the fatherland and the dynasty is being decided.” The tsar said to his minister of the court, Frederiks: “Again that fat-bellied Rodzianko has written me a lot of nonsense, which I won’t even bother to answer.” But no. It was not nonsense. He will have to answer. The council of ministers deemed this a suitable day to remove from their midst the presumed cause of all misfortunes—the half-crazy minister of the interior Protopopov. At the same time General Khabalov issued an edict—prepared in secrecy from the government—declaring Petrograd, on His Majesty’s orders, under martial law. So here too was an attempt to mix hot with cold—hardly intentional, however, and anyway of no use. They did not even succeed in pasting up the declaration of martial law through the city: the burgomaster, Balka, could find neither paste nor brushes. Nothing would stick together for those functionaries any longer; they already belonged to the kingdom of shades. The principal shade of the last tsarist ministry was the seventy-year-old Prince Golytsin, who had formerly conducted some sort of eleemosynary institutions of the tsarina, and had been advanced by her to the post of head of the government in a period of war and revolution. When friends asked this “good-natured Russian squire, this old weakling”—as the liberal Baron Nolde described him—why he accepted such a troublesome position, Golytsin answered: “So as to have one more pleasant recollection.” This aim, at any rate, he did not achieve. How the last tsarist government felt in those hours is attested by Rodzianko in the following tale: With the first news of the movement of a crowd toward the Mariinsky Palace, where the ministry was in session, all the lights in the building were immediately put out. (The government wanted only one thing—that the revolution should not notice it.) The rumor, however, proved false; the attack did not take place; and when the lights were turned on, one of the members of the tsarist government was found “to his own surprise” under the table. What kind of recollections he was accumulating there has not been established. But Rodzianko’s own feelings apparently were not at their highest point. After a long but vain hunt for the government by telephone, the president of the Duma tries again to ring up Prince Golytsin. The latter answers him: “I beg you not to come to me with anything further, I have resigned.” Hearing this news, Rodzianko, according to his loyal secretary, sank heavily in an armchair and covered his face with both hands. “My God, how horrible!... Without a government...Anarchy...Blood,” and softly wept. At the expiring of the senile ghost of the tsarist power, Rodzianko felt unhappy, desolate, orphaned. How far he was at that moment from the thought that tomorrow he would have to “head” a revolution! The telephone answer of Golytsin is explained by the fact that on the evening of the 27th the council of ministers had definitely acknowledged itself incapable of handling the situation, and proposed to the tsar to place at the head of the government a man enjoying general confidence. The tsar answered Golytsin: “In regard to changes in the personal staff in the present circumstances, I consider that inadmissible. Nicholas.” Just what circumstances was he waiting for? At the same time the tsar demanded that they adopt “the most decisive measures” for putting down the rebellion. That was easier said than done. It required an insurrection of the whole guard, the entire garrison, to compel this Hessian zealot of autocracy to agree that “concessions are necessary.” Now the tsar also begins to suspect that the “fat-bellied Rodzianko” had not telegraphed nonsense. Nicholas decides to join his family. It is possible that he is a little gently pushed from behind by the generals of the staff, too, who are not feeling quite comfortable. The tsar’s train traveled at first without mishap. Local chiefs and governors came out as usual to meet him. Far from the revolutionary whirlpool, in his accustomed royal car, surrounded by the usual suite, the tsar apparently again lost a sense of the close coming crisis. At three o’clock on the 28th, when the events had already settled his fate, he sent a telegram to the tsarina from Vyazma: “Wonderful weather. Hope you are well and calm. Many troops sent from the front. With tender love. Niki.” Instead of the concessions, upon which even the tsarina is insisting, the tenderly loving tsar is sending troops from the front. But in spite of that “wonderful weather,” in just a few hours the tsar will stand face to face with the revolutionary storm. His train went as far as the Visher station. The railroad workers would not let it go farther: “The bridge is damaged.” Most likely this pretext was invented by the courtiers themselves in order to soften the situation. Nicholas tried to make his way, or they tried to get him through, by way of Bologoe [a town halfway between Moscow and St. Petersburg] on the Nikolaevsk railroad; but here too the workers would not let the train pass. This was far more palpable than all the Petrograd telegrams. The tsar had broken away from headquarters, and could not make his way to the capital. With its simple railroad “pawns,” the revolution had cried “check” to the king! The court historian Dubensky, who accompanied the tsar in his train, writes in his diary: “Everybody realizes that this midnight turn at Visher is a historical night.... To me it is perfectly clear that the question of a constitution is settled; it will surely be introduced.... Everybody is saying that it is only necessary to strike a bargain with them, with the members of the Provisional Government.” Facing a lowered semaphore, behind which mortal danger is thickening, Count Frederiks, Prince Dolgoruky, Count Leuchtenberg, all of them, all those high lords, are now for a constitution. They no longer think of struggling. It is only necessary to strike a bargain, that is, try to fool them again as in 1905. While the train was wandering and finding no road, the tsarina was sending the tsar telegram after telegram, appealing to him to return as soon as possible. But her telegrams came back to her from the office with the inscription in blue pencil: “Whereabouts of the addressee unknown.” The telegraph clerks were unable to locate the Russian tsar. The regiments marched with music and banners to the Tauride Palace. A company of the Guards marched under the command of Cyril Vladimirovich, who had quite suddenly, according to Countess Kleinmichel, developed a revolutionary streak. The sentries disappeared. The intimates were abandoning the palace. “Everybody was saving himself who could,” relates Vyrubova. Bands of revolutionary soldiers wandered about the palace and with eager curiosity looked over everything. Before they had decided up above what should be done, the lower ranks were converting the palace of the tsar into a museum. The tsar—his location unknown—turns back to Pskov, to the headquarters of the northern front, commanded by the old General Ruszky. In the tsar’s suite one suggestion follows another. The tsar procrastinates. He is still reckoning in days and weeks, while the revolution is keeping its count in minutes.